1. Preheat the oven to 220°C, gas mark 7. Put the butternut and garlic into a medium roasting tin then toss with the oil. Bake for 15 minutes, add the chicken and bake for 15 minutes more until the chicken is crisp, thoroughly cooked with no pink meat or juices, and the squash tender. 2. For the Caesar-style dressing, combine the mayonnaise, vinegar, 2 tbsp grated Parmigiano Reggiano and 2 tbsp water. When the chicken and squash are ready, remove from the oven. Mash the roasted garlic into the dressing and season. 3. Pour most of the dressing over the leaves and toss well. Cut the chicken into bitesize pieces and scatter with the butternut over the leaves, then with the remaining dressing and cheese. 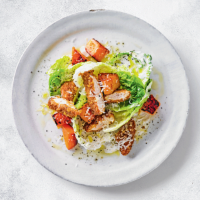 Cook’s tip For an even easier and quicker option, try the ready made Waitrose Chicken Caesar Salad instead.